* Outer angle, Inner angle chamfering and Facing. Machine designed to be flexible, prompt action, accurate for large-diameter outside diameter, inside diameter and flat double-ended chamfering. Simple structure. A type Spindle: Inverter + AC Induction motor, B type Spindle: Server motor, Server motor drive cam-feeding with the same motion and shorten cycle time. Easy setting and fast adjustment by touch sensing screen. Motion cycle includes automatic material in feed through a channel (automatic feeder is optional). Automatic cutting feeding retracting and automatic workpiece out feed. Continuous motion cycles provide high machining speed, high accuracy, reduced labor requirement and easy operation while greatly upgrading productivity. 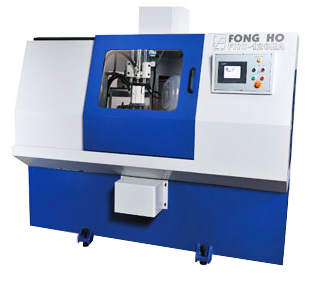 * This custom machine is designed according to assigned workpieces, specification and drawing. 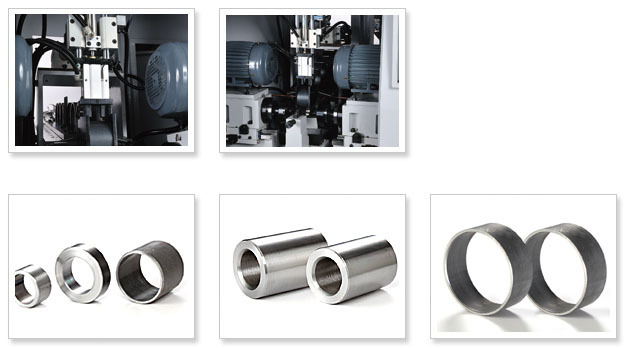 Please specify the OD, ID, end-face, chamfering angle and end knurling of the workpiece. According to customers special needs, we made custom machine.